As most of central London closes down late at night and the crowds head home, there are a select few who come out only after midnight. 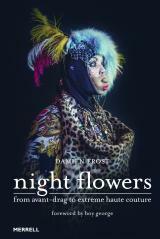 These ‘Night Flowers’, as they refer to themselves, encompass a loose-knit community of drag kings and queens, club kids, Goths, alternative queer and transgender people, fetishists, and cabaret and burlesque performers – all of whom bloom late at night and burn brightly under the city’s neon lights. Damien Frost’s arresting photographic portraits capture those who dwell on the fringes of nightlife in modern London, dressing in all manner of guises. The portraits are the result of a project begun by Frost in 2014, when he went out every night to wander the city streets in search of its most colourful inhabitants. There he first came across the world of the Night Flowers and started documenting their wild looks and vivid creative expression. Although traditional in style, for the most part the photographs were taken as incidental portraits after chance encounters on the street, down dark alleys or backstage in a club; the poise and grace of the subjects belie the quizzical looks, negative comments or even taunts thrown at the sitters by passers-by. Frost’s background in opera and theatre gave him a deep appreciation of the intricate details of the make-up and costumes, and of the many hours of preparation that it takes for each Night Flower to turn him- or herself into an ephemeral work of art. The resulting book is an extraordinary and powerful document of the ultimate alternative street style. Damien Frost is an Australian-born artist, graphic designer and photographer who works across the fields of painting, photography, website design, illustration and print design. He currently lives in London. If one picture is worth a thousand words then Night Flowers would be five complete sets of the Encyclopedia Britannica. Damien Frost provides the reader with photography of aspects of fashion and style that boggle the mind yet broaden the spectrum when it comes to what is considered or defined as fashion. This is a book that should have been coffee table size due to the quality of photos and the absolutely stunning subjects. For some readers, the book will be dismissed as glorifying something that goes against the grain or is incomprehensible, but Damien Frost has swung open the door and exposed a part of fashion and life that might be considered its nadir when in actuality it might be its apex. Marinate on that thought. “Night Flowers isn’t in common use, but it’s a poetic way to describe those people who constitute the more colorful elements of London’s alternative club, queer, performance and arts scene,” writes Damien Frost. The reader is catapulted head first into a world that will be alien to most but yet this reviewer’s fashion history caused reactions such as profoundly inspiring, brilliant, horrifying, genius, enlightening, and some might say grotesque. The point here is that Night Flowers is a visual exploration, as well as a feast, by a photographer who took one photo every day for one year. There is little text to be found here, but Frost’s introduction is far more adequate than most since in his abbreviated verbiage, he more than gives you the rasion d’etre for this incredible book as well as the parameters that were set for each photo. It is provocative and possibly shocking to some but for the seasoned fashionphile this is a book that will give you great pause when you grasp the plethora of fashion influences and influencers present on these pages. Would this reviewer recommend the book? The answer is unequivocally yes as its appeal is multifaceted, which means it is not just limited to what some might call drag queen drama. Night Flowers is about fashion, photography, self-expression, and innovation, and to think otherwise is to expose one’s less than fully formed fashion I.Q.